We decided to decorate our baby boy's room with jungle themed nursery decor. As you can see from the pictures of the nursery, we took our cues for the nursery's color scheme from the jungle nursery bedding set. We used the colors in the fabric to choose the best paint colors for the nursery walls. The name of the crib set is Monkeying Around by Bebe Star. The colors in the bedding are white, blue, green and brown. The crib quilt and the bumper pad has pictures of monkeys with a large image of a monkey lounging in a hammock hung between two tropical palm trees which are the foundation of the room's decorations. After we painted the nursery walls in blue and green we added the large stuffed giraffe and tiger to make a big visual statement. As a finishing touch, we got the vines to decorate the ceiling from a local craft store. Thanks for sharing Caden's nursery pictures with us, Ashley! 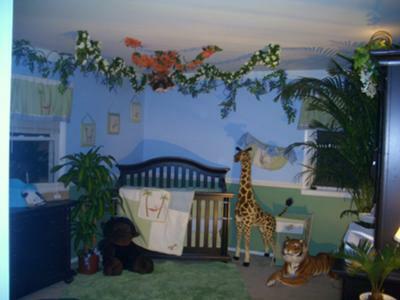 Your jungle themed decorations have given your baby boy lots of interesting things to look at and entertain him in this lovely room! I think that you did a great job on your baby boy's nursery decorating project and I'm sure that others that visit Unique Baby Gear Ideas will feel the same. 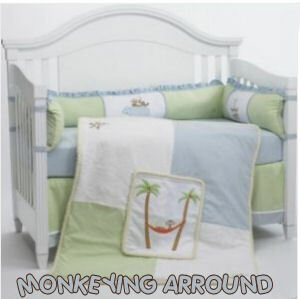 Ashley, I love the Monkeying Around crib set, too and plan to buy it for my baby boy's room. I enjoyed reading your step-by-step instructions for decorating the nursery walls, etc. Ash, you are just a creative as you mom has always been. The room looks simply awesome. You are going to be a great mother. I am very proud of you my beautiful niece! Love You! LOVE LOVE LOVE THIS ROOM WHAT LITTLE BOY WOULD NOT WANT A ROOM LIKE THIS VERY CREATIVE!!!! Great job Ashley and Keith! What a cute room for baby to come home to. I love what you did! Caden is gonna love his room! Awesome room. He is a very lucky boy. This looks awesome, you guys did a wonderful job!!! My cousin did an awesome job on this nursery! The pictures don't do it justice! It is the coolest one I have ever been in! Good luck Ash an Keith!